Fela once said to me in 1976: “ID, if you don’t blow your trumpet who on earth will blow it for you!” He made the comment following an article I wrote with inputs from Lemi and Duro my co-members of YAP Care-Taker Committee, published in our newsletter YAP News titled: “Youths Demand the Removal of Colonel Tarfa” - our reply to the horse-whip measure the Nigerian military regime introduced to de-congest the crawling Lagos traffic in preparation for the Second World Black Festival of Arts and Culture (FESTAC ’77). Like I affirmed in my book: titled: Fela – Phenomenon & Legacy, Fela used to encourage me to write, to the displeasure of some of his friends older than we YAP boys. The article was pretty long and in it - I mentioned the history of the Nigerian army as representing the colonial institution that dominates Africa. However Steve Udah Africa 70 Organisation press attaché, was not happy with the “preferential treatment” he claimed Fela accorded us (YAP Boys). He re-wrote the article cutting out all the history of colonial army I had stressed. When Fela was presented the edited version, he turned to me asking why I let Steve re-write what he considered a well explicit article. I replied that Steve was claiming to know more about writing than I did hence my compromise. Fela was furious with me, saying if I was not capable to defend my works then who would. From then on, I wrote most of the articles we published in the YAP newsletter. My answer to his tirade: “If you don’t understand the link between making Kalakuta history and the actions that made that history you must have a problem. 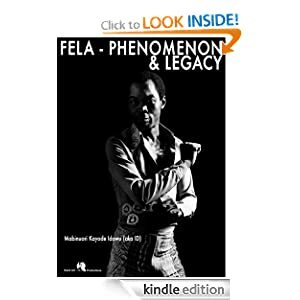 You still haven’t answered my question have you read Fela - Phenomenon & Legacy? If not you are not best placed to make all the talk above. For your information my first book on Fela published in1986 has been translated in Japanese, French and Italian languages, making me one important reference on the subject of Fela. “My memories in Kalakuta were not pleasant? After my departure from Kalakuta; Fela was asked who were the people he held in high esteem and he mentioned my name first - go listen to Fela Speaks on my website: www.radioshrine.com. Since you claim to know much about me it would be proper of you to take-off your Yoruba Arts Festival mask so I can know who is hiding behind it.” Since my demand to take-off his or her mask, it is absolute silence radio from whoever is behind the mask. My answer to the claim that the story about me in Kalakuta after my departure wasn’t that pleasant is, we have people still very much alive today who were either members of Young African Pioneers, Africa 70 Organisation, Movement of the People (MOP), Egypt 80, regular Africa Shrine members, or simple Kalakuta Republic residents that can testify to my stewardship in Kalakuta – I am sure they will never say I never had a not pleasant track-record in Kalakuta. People like Duro Ikujenyo, YAP member and now Oba of Erijiyan-Ekiti Fesobi Olawaiye, Ndubisi Okechime, Dele Sosimi, Pastor “God’s Power” Orishegbemi Ejeba, Adéboyé Adegbenro, Lekan Babalola, Bodunrin Ajayi, Leon Kaleta Ligan-Majek, regular visitors and bloggers Jimi Disu, Basil Okafor, Azuka Jebose and Toyin Makanju (of blessed memory) to mention but a few. Who is the kidnapped smiling lady with the crutch? Who is her smiling, hooded kidnapper? Where did the kidnapping take place? How was she rescued from her kidnappers? Can anyone identify the woman walking & carrying a child in the background? With a zoom can anyone identify the baby she was carrying? The kidnapped smiling lady with the crutch is Mrs. Sadie Eileen Taylor (fondly called Nanny, I called her mom like Fela) she is the mother of Remi Anikulapo-Kuti (of blessed memory) - Fela’s first wife and mother of Yeni, Femi, and Sola (of blessed memory). Her smiling half-hooded kidnapper was me (Mabinuori Kayode Idowu) and the alleged kidnap took place in Innsbruck, Austria in 1992. The woman in the background was Remi Anikulapo-Kuti, and in her arms Rolari Segun her grand-daughter. It was during a tour of Europe I organized for Femi Kuti & Positive Force. During the group’s performance in Salzburg two days earlier, mom fell backstage and sprained her ankle. After she was taken to and treated in the hospital, she was advised to walk with a crutch. We were 19 Africans on the tour and on the day in question when the picture was taken, we had gone into a restaurant to eat launch before the concert in Innsbruck. Our night-liner bus was packed about two-hundred and fifty metres away from the restaurant and I realised the difficulty mom had walking to the bus so I offered to carry her. We were all in a gay mood as can be seen in the picture, and while I was trying to settle mom down in her place in the bus two armed Austrian police men came aboard the bus after blocking with two police cars the front and rear of the bus we were travelling in. One of the police men, demanded mom’s identity in Dutch language which none of spoke. Our German bus driver answered that she was a member of our entourage and Remi realising the problem of mistaken identity affirmed that the old lady was her mother. Only then did the police relax their aggressive stance, they explained that they got a call from someone in the neighbourhood claiming we had kidnapped an “old white lady”. Today looking back at the event and the troubles caused us, I believe it was an incidence that can be termed as “being our neighbour’s keeper” – a lesson that not all European attitude should be considered negative. The incidence described above took place about ten years after my departure from Kalakuta, if I had a bad reputation in Kalakuta as some advocates of the spirit hoax saga in Kalakuta would want people to believe, I guess there wouldn’t have been that kind of continuity and cordiality in my relationship with the family. Also important to note, mom lived with Fela and his first family in 14A Agege Motor Road before it became Kalakuta Republic from 1964 - 1971. After the burning of Kalakuta and the financial difficulties Fela encountered from Obasanjo’s regime trying to crush Kalakuta rebellion, Fela couldn’t pay the house rent of his immediate family forcing them to move-in with us in Atinuke Olabanji Street Kalakuta. Of all the more than two hundred people that lived in Kalakuta, I can count on my finger-tips how many of us mom would allow to carry her the way I did in the picture. This is no question of being snobbish on her part, rather it was more a question of being reserved like any aged person - her still living grand-children can testify to this claim from me. It is important to note that thanks to financial helps from some faithful friends, Fela managed to keep his organisation going with all the moves by General Obasanjo’s regime to strangle him financially. Friends like late Senator Victor Akan and Oba Dapo Tejuosho. I remember going with Fela to the gentlemen mentioned above and Fela solicited their help for money to keep his organisation going. Most times, they gave maximum of what they had in their respective homes and asked Fela to send a trusted aid to recover whatever amount left they promised. I collected on behalf of Fela from each of the gentlemen mentioned above, more than ten thousand Naira, at least on three occasions respectively. In today’s exchange rate, One Dollar = Two hundred Naira. Again without any apology to anyone be it Fela’s child or not, to limit his struggle to the last 10 years of Fela’s life and considering them “the most important and significant years of Fela’s life, is pure ignorance of the principles of Fela’s struggle. It shows that whoever is making such claims never learnt anything in Kalakuta other-than smoking Igbo (marijuana) and sleeping with women at an early age. Instead of looking into my posts and trying to start debate or discursion that will help us advance our struggle, they reduce it to personal attacks and trivialities. The solace people like me who still keep-up our struggle have from these types of diversions is that we have people out there who are listening and believe in what we are doing. They send encouraging words publicly and in private to spur us on. The post by Ibiwumi Olaiya as you can see is from a sister thinking and conscious of our priorities in the struggle. Not forgetting messages and posts from Tracy Robinson, ‘La Grand Dame’ of our facebook group - The Hope Warrior. I remember shortly after laying her hands on my book she said to me: “ID! With this book, you have the microphone!” Yes Sister Tracy, I have the microphone and like Fela would say “I will tell them make them hear! If I may blow more loudly my trumpet; I challenge anybody out there to say the contrary, we YAP Boys were to Fela what Malcolm X was to Nation of Islam, we were what Reverend Jesse Jackson, Mayor Andrew Young, and others were to Reverend Martin Luther King Junior and the Civil Rights Movement. If our struggle has not been given the due recognition it deserves, the reason is not far fetched – African struggle has always been swept under the carpet thanks to diversions like those mentioned above and other obvious reasons. If the title of their film was: “Finding Fela among his siblings and their business associates”, I will not make any comments – it would have been clearer where they want to look for Fela. I would like to conclude my self-trumpet blowing the way I did with my so-called Yoruba Art Festival critic: I don’t make comments for the sake of talk. If you read Fela - Phenomenon & Legacy you will understand that it is not the message of one looking for recognition. It is a chronicle from one who was a part of all the actions and decision that made Kalakuta history. To reduce Fela’s life to just the last ten years of his existence is talking without reasoning. Radio Shrine! Gan! Gan! Please Pass The Message!